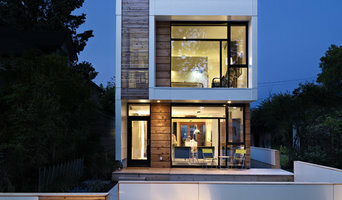 E3 Architecture is an Edmonton-based boutique architecture and design firm. We design creative contemporary houses with a European touch. We work closely with our clients to create site specific homes with a strong inside-outside connection. We know the impact architecture has. For better or worse, buildings last a long time, so we don’t go for quick and easy solutions. We care about our environment and try to make a difference, knowing the most sustainable buildings are those people love and want to take care of. A house that has your heart, is a home that will last. Some of our projects are very high-end, others have tight budgets. Some are compact others very large. Our focus is value–whether there is lot of money or time, or a little. We see each project as a creative challenge, in need of our complete dedication, design talent, and knowledge of building technology and the construction process. E3 is located in the former St. Stephens Church. Threatened with demolition, we’re giving this 100 year old historic building on Edmonton’s Church Street a second chance. We’re restoring, re-purposing and loving working under it’s vaulted roof and beautiful arches, being bathed by natural light. Inspiring us every day. FUSE Architecture + Design offers a full range of professional services in architecture and interior design. Our diverse background offers experience in almost every type of building and project. From eco-friendly residential homes, to commercial, government, industrial, education, recreation and medical projects, FUSE uses real-world experience to create unique and useful design. The House Company was established in Edmonton 32 years ago by four partners in the spirit of providing excellent design and the best quality of construction and service possible. Today, two of those original owners, David Poetker, manager of operations, and Jamie Thompson, principal designer, remain, and Graham Underwood, project manager, has become a third owner. We have specialized in residential projects since our beginning and hold a strong belief that rebuilding in Edmonton's older central communities is preferable for the healthy and sustainable future of our city. Our clients realize that the highest value comes from careful planning, and the use of high quality materials and fully skilled trades. Our focus continues to be the expansion of our technical knowledge of building and the delivery of remarkable houses in visual, practical, functional, and sustainable terms. We limit our production to about six projects a year, which ensures that each one gets the full attention its owner deserves. We train and maintain our own crews of carpenters, who are capable of both framing and finishing our projects to the standards we require. The House Company is a participating contractor with Energy Efficiency Alberta's Home Improvement Rebate program. It’s all in the details. This is the philosophy that Boss Design Ltd has utilized since its inception. With this philosophy, we have built our business solely on referrals. We believe in creating lasting relationships with our clients. Truly understanding our clients lifestyle and dreams is the only way to design a house that you and your family can call home. At Boss Design Ltd, we work diligently to not only design your home but to elevate the knowledge level of our clients. It’s our responsibility to ensure our clients have the information they need to complete the design and construction of their dream home. This is what sets us apart; the commitment to the whole project, not just to our portion of the work. Whether your home is large or small, in the city or on an acreage, we will assist you throughout the whole custom house design process. With the help of some sophisticated technology, we can ensure that the house we have designed is exactly what you envisioned. We are a full service renovation design and construction company. Don't know what you need or want ...we can help you create a beautiful and functional design, that our talented team will craft with care and pride. Whether your bathroom needs some helping leaving the 80's or your kitchen is not worthy of your cooking we would love to help! Our Work is Who We Are: Enhancing communities one home at a time. Salisbury Landscaping is an award winning design and build landscape firm servicing the greater Edmonton area. Salisbury Landscaping wants to bring your vision to life. Living in Alberta we only have a number of days to enjoy our outdoors. Make the most of them with Salisbury Landscaping and have outdoor moments that fit your wants, needs and budget. Land Faculty is an interdisciplinary design partnership specializing in identity & space. We also pusue design challenges of all types in the areas of building design, interiors, landscape, urban design and exhibition design. Our team offers significant experience and brings forward diverse perspectives to all our projects. The group is committed to maintaining the highest standard in all we deliver. 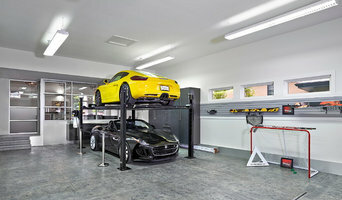 AB Design Inc has an association of technicians creating a design and technical powerhouse. The team also includes highly skilled individuals with the ability to prepare realistic 3D models and renderings. We are a team unlike any other. We focus on a continuous improvement policy. While dedicated to our current projects, the team makes the time for research in developing better strategies and skills. AB Design Inc is continuously evaluating the production process in order to develop efficiency, effectiveness and flexibility. Aurora Home Design & Drafting Ltd.
We work with you from your first ideas to the final drawings ready to build and order your materials from. We care that you're happy with your home, whether it's New, or a Renovation of your existing house. Work with us and we'll work with you. We design spaces for real life. A progressive interior design studio that goes beyond the pretty. Full service custom home design firm. We specialize in new home designs, 3D renderings and renovation drawings. How do I find the best Edmonton, AB architect for my home design or renovation project? When building or renovating your home, you don't simply hire an architect or building designer — you build a relationship with them. Be sure you chose a home architect who will be involved in all phases of the design process, from the initial concept to the completed construction. Architecture is an incredibly technical profession and one where getting things wrong can literally put lives at risk, so ensure you hire a professional with a valid license or an architectural firm to maintain high quality and standards. Your next consideration will be architectural style. Some residential architects specialise in designing traditional homes or farmhouses, others in designing modern replicas of traditional homes. While a few have a knack for imagining bolder, more futuristic architectural design in Edmonton, AB that incorporates the latest technology. How much does hiring an architect in Edmonton, AB cost? Home construction and renovation often have a preset budget and hence it is important to understand how much architects charge. While there is no set payment structure, independent architects may charge differently from architectural firms. Architects sometimes choose to calculate their fees on the basis of a per square foot rate. In rare cases, especially with smaller projects, Edmonton, AB architects may choose to ask their clients for a fixed fee. Make sure the total figure and payment schedule is agreed as part of your contract, particularly if you are trying to accurately estimate the cost of building a house. Find a home architect in Edmonton, AB on Houzz. Narrow your search in the Find Pros section of the website to Edmonton, AB architects. You may also look through photos projects to find building designers in Edmonton, AB who have worked on a project similar to yours.